Public relations professionals wear many hats and must be able to multi-task in order to fulfill several duties; they maintain media relations, internal and external communications and marketing functions. One significant responsibility of today’s PR professionals is crisis communications. A crisis is a major occurrence that could negatively impact a company. Any company in any industry can face a crisis and this week, American Airlines had to deal with an unexpected turn of events on Twitter. 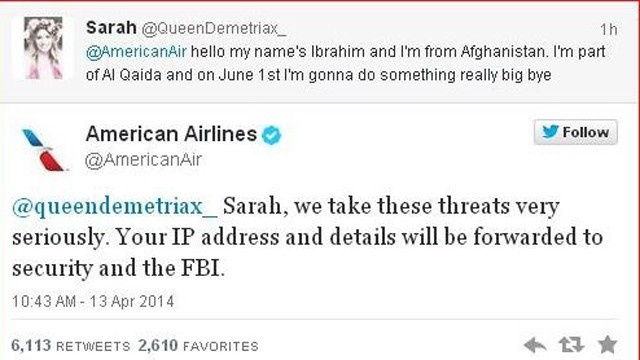 Sunday, April 13, a 14-year-old girl with the Twitter username @QueenDemetriax and named “Sarah” tweeted at American Airlines, “hello my name’s Ibrahim and I’m from Afghanistan. I’m part of Al Qaida and on June 1st I’m gonna do something really big bye.” American Airlines responded, “Sarah, we take these threats very seriously. Your IP address and details will be forwarded to security and the FBI.” Feeling threatened, Sarah posted a frenzy of sporadic tweets expressing it was a prank and pleading for the company not to take legal action. The next day, Sarah turned herself in to the police in the Netherlands. She is being interrogated, and the exact intention behind her prank threat is being investigated. Many who witnessed the intense Twitter exchange believe that American Airlines was too harsh on the young girl, and others believe that she rightfully deserves her punishment. The public has taken to Twitter to fervently defend and condemn Sarah’s actions. I learned in my strategic crisis communications class that crises have five stages: detection, prevention/preparation, containment, recovery and learning. Examining the situation from a crisis perspective, American Airlines detected the threat as a prodrome, or warning sign, to a potential terrorist attack and worked to prevent the crisis by responding in a firm, deliberate manner. The company made efforts to contain and recover from the developing crisis by deleting the Twitter responses to stop people from encouraging the behavior so the posts would not get out of control. American Airlines can learn from the situation by evaluating the positive and negative outcomes in order to be prepared for a similar occurrence in the future. Whether or not the terrorist threat was real, the company took immediate necessary action in order to keep its customers out of harm’s way. As an aspiring PR professional, how would you handle this situation? Give us your feedback, and don’t forget to follow us on Facebook and Twitter!